Telemark blessed us with 30 cm of powder during the races today. The BC X-C Championships will continue on Sunday. Click here to read about trail closures. All skiing and snowshoeing trails are open at 02:00 PM on Saturday. The parking lot will be very busy until that time. 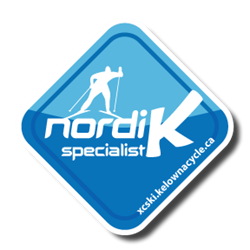 For the best place to get Telemark trail information click here. Any bags, boots or bags left on the table of floor of the upper chalet on Sunday will be moved to the athletes lounge in the grooming shed.